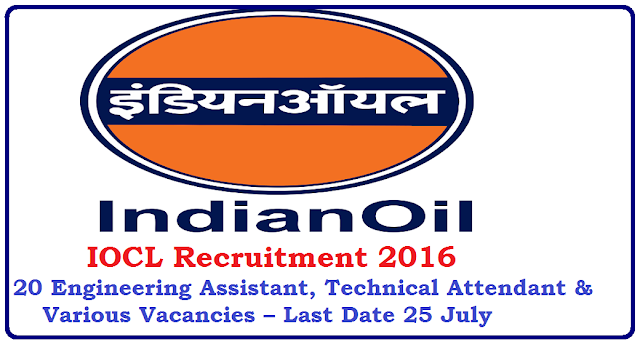 Indian Oil Corporation Limited (IOCL) invites Application for the post of 20 Engineering Assistant, Technical Attendant & Various Vacancies in Paradip-Raipur-Ranchi. Apply before 25 July 2016. For Technical Attendant : Matric / 10th pass and ITI pass from a Govt. recognized Institute in the specified ITI Trades. Selection Process : Selection will be based on written test followed by Trade Test/Personal Interview. Application Fee : General and OBC category Candidates have to pay Rs. 100/- through Demand Draft in favor of Indian Oil Corporation Ltd (Pipeline Division) payable at State Bank of India, Bhubaneswar Main Branch Odisha. How to Apply IOCL Vacancy : Interested candidates may apply in prescribed application form along with self attested photocopies of testimonial in proof of age, education qualification Matric onwards, application fee, wherever applicable , caste certificate, disability certificate, discharge certificate etc. send to Senior Human Resource Manager, Indian Oil Corporation Limited (Pipelines Division), Post Box No. 96, Bhubaneswar-751001, Odishaon or before 25.07.2016.